Last weekend, Memorial Day weekend, we spent a lot of time working on Baby Mattie's new room which is currently Brody's room. Since Daddy painted, we thought it would be best to let Brody try sleeping in his bed in big brother's room to let the paint smell have time to dissipate. We purchased a bed rail to hopefully help keep him in the bed and make it less tempting for him to get up in the middle of the night. We don't want to fully switch him to the new bed until big brother is out of school (this is his last week of kindergarten!) because Evan gets up earlier than Brody needs to. Daddy got Brody to sleep on Saturday night and carefully tucked him into his new bed with his cute little car and truck themed sheets. Unfortunately, he did wake up a few times and come into our room, but he finally settled down and slept through the night. He definitely proved he can get himself out of the bed, but hopefully, he will learn to enjoy sleeping in his new bed. 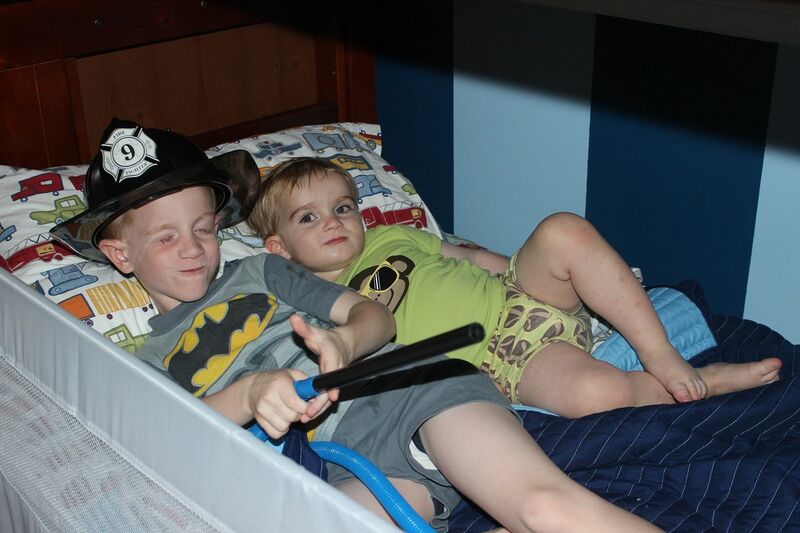 Lying down with his superhero firefighting big brother. I am sure that made him feel very safe! I can't believe you are switching him to a big boy bed already. Yikes!!! You are so brave!!! I can't imagine taking Rachel out of her crib yet. It sounds like the first night went fairly well so way to go Brody! Well, you know I don't really have a choice. 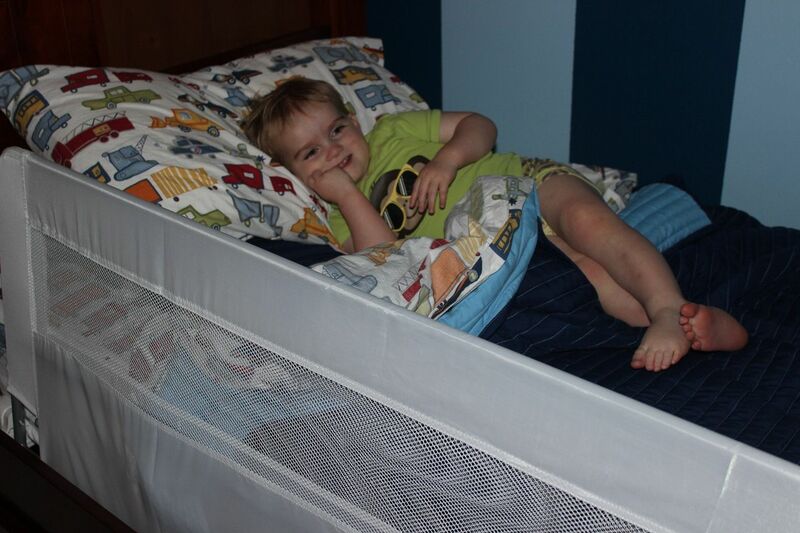 Actually, we "moved" Evan to a big boy toddler bed right when he was two, and he did great. He didn't actually have to move because his crib converted so we just removed the front rail. For Brody, he is moving into big brother's room to sleep on the bottom bunk of the new bunk bed. They are both great night time sleepers so hopefully we won't have any trouble. We moved Spencer to a bed 1 month after he turned 2. The big difference was that we were moving him from our bed to his own bed because he literally never slept in his crib a day of his life. An even bigger day was when he moved to his own room when he was 3. Ha! Congratulations on the new big boy bed, Brody (BBBB!). You look so grown up in it!